Surprise or Magic Lilies are just Naked Ladies! 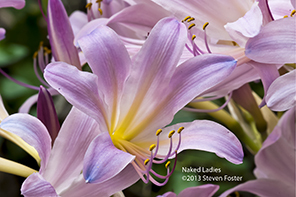 Naked ladies or Surprise lilies trumpet their pink splendor in mid to late summer. These beautiful ladies are part of our foreign diversity in Eureka Springs and eastern North America generally, but alas they are just plants. Known as surprise lily, resurrection lily, magic lily or naked ladies, this pretender is laid bare not as a lily at all but a member of the Amaryllis family (Amaryllidaceae). These late blooming beauties produce unnoticed leaves in the spring, which soon die back. Out of the hot bosom of steamy August air a whorl of large showy flowers atop a leafless (naked) stalk pops from the ground. From a 9 April 1990 article by Sereno Watson in Garden and Forest_A Journal of Horticulture, Landscape Art and Forestry. Although not generally considered a medicinal plant, it does have bioactive components. Fayetteville, Arkansas’s KUAF Producer, Jacqueline Froelich aired a story on Surprise Lilies on 14 August 2014. You can listen to the story here. One of the alkaloids found in Lycoris squamigera is galanthamine, one of several toxic compounds in the plant. It is also famously known from the related amaryllis family member Galanthus nivalis or snow-drops a common alpine species in mountains of Europe, which is grown as an ornamental in North America, and occasionally naturalized. First isolated in the 1950s, galanthamine, formerly extracted from Galanthus nivalis, is now produced synthetically on an industrial scale. It was used in some parts of the world in the 1950s to treat nerve pain associated with polio. Today, the compound is regarded as a long-acting, selective, reversible and competitive acetylcholinesterase (AChE) inhibitor used in the systematic treatment of mild to moderate cognitive impairment in early stages of Alzheimer’s disease. Amaryllis and it relatives cause plant name consternation. The genus Lycoris (to which our naked ladies belong) is native to eastern Asia, while Amaryllis is native to the Western Cape of South Africa. 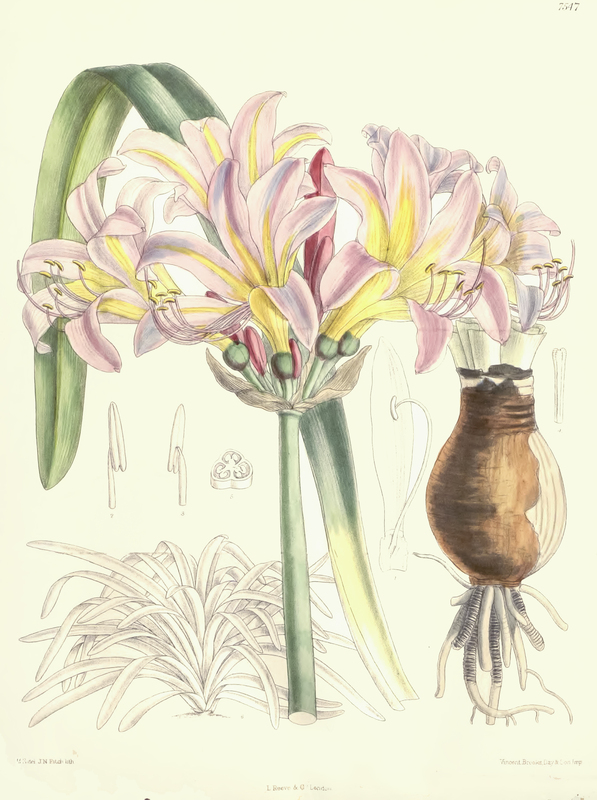 In 1753 Linnaeus named Amaryllis belladonna. Another closely related genus in the Amaryllis family is Hippeastrum from tropical America. The “amaryllis” that bloom around Christmas, available wherever bulbs are sold, are mostly hybrids of South American Hippeastrum species. Lycoris squamigera #7547 from Curtis’s Botanical Magazine, 1897. 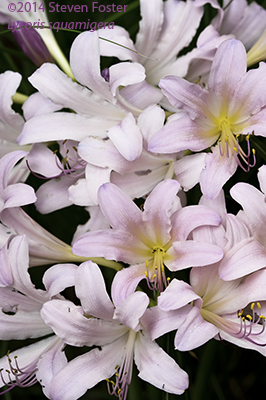 Our common naked lady is the Asian species Lycoris squamigera, an inelegant scientific name for an elegant plant. It superficially resembles the South African Amaryllis belladonna but differs in significant botanical characteristics as well as continent of origin. The first European illustration comes from a periodical famous for its unabashed Victorian paintings of reproductive organs (of plants)—Curtis’s Botanical Magazine volume 123, August 1, 1897. No doubt many gardeners, horticulturists and botanists have been confused by these relatives in the amaryllis family. 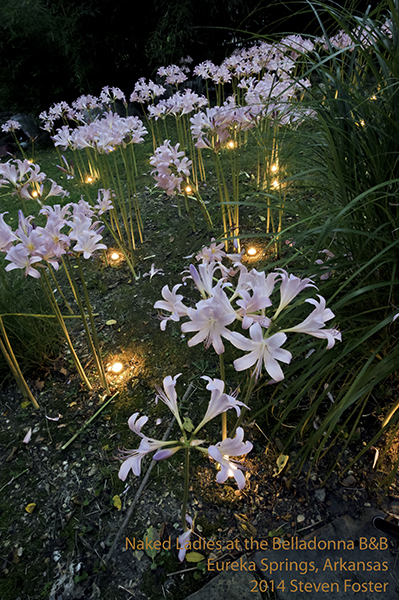 It is no surprise that the surprise lily itself has lived under three scientific names over the decades including Hippeastrum squamigerum and Amaryllis hallii as well as the name used for more than a century—Lycoris squamigera.